There's a giant rock surrounded by yellow-painted curbs in a northwest Calgary parking lot and drivers can't seem to stop hitting it. Drivers can't seem to stop hitting a giant rock in a suburban parking lot, despite it being an inanimate object surrounded by yellow-painted curbs. "I don't know how you miss this big rock or how you cut the curb so tight you end up jacked up on the rock," said Brangwyn Jones, who lives in the northwest community of Sage Hill. "I'm trying to wrap my mind around it, as are many of the community members." 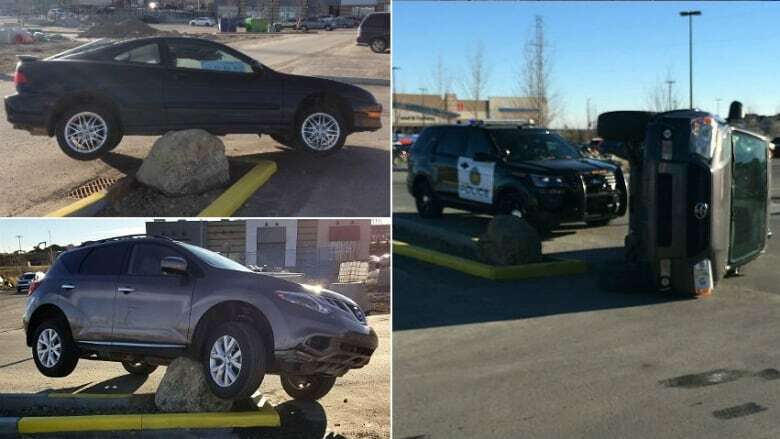 After several collisions, the Sage Hill Rock — as it has become known among area residents — is now set to be removed from a retail shopping complex that is still being developed in the relatively new community. At least three crashes were documented in photographs posted on the weekend to a community Facebook group that Jones administers. Mark Nguyen took one of the initial photos of a SUV lying on its side next to the rock. He said he was on his way to the nearby Walmart around 1 p.m. Saturday when he spotted the bizarre scene. Photos of two more vehicles that had become hung up on the rock were also posted by the group. One of the vehicles was a small coupe with low clearance but it still managed to get on top of the large stone. 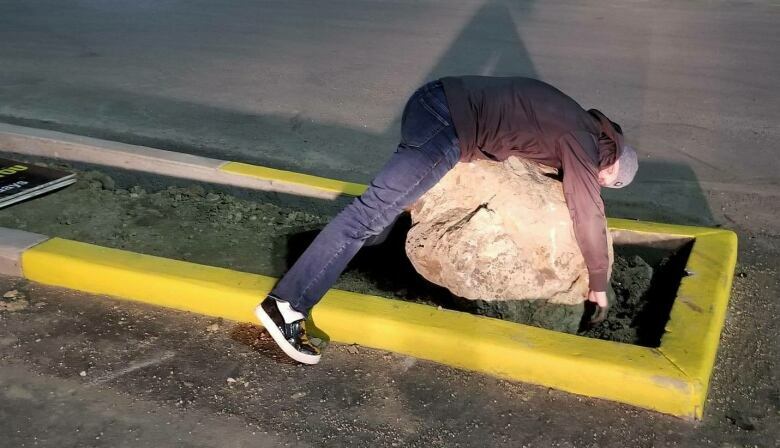 An employee of the nearby bottle depot, which opened in mid-October, said the rock was placed there to prevent motorists from driving over the curb but it's now going to be removed by Riocan, the company that manages the retail complex. CBC News has reached out to Riocan for comment. Jones said no injuries have been reported, as far as anyone is aware, and the incidents have become a bit of a running joke in Sage Hill. "To be honest, this kind of made our weekend," he said. "I was very surprised how many people were into the Sage Hill Rock." When the community learned Monday the rock is to be removed, many on the Facebook group were upset at the loss. "No! Leave it!," one person posted. "It's far too entertaining!" "Poor misunderstood rock," added another. Jones said the rock "has become a part of us." 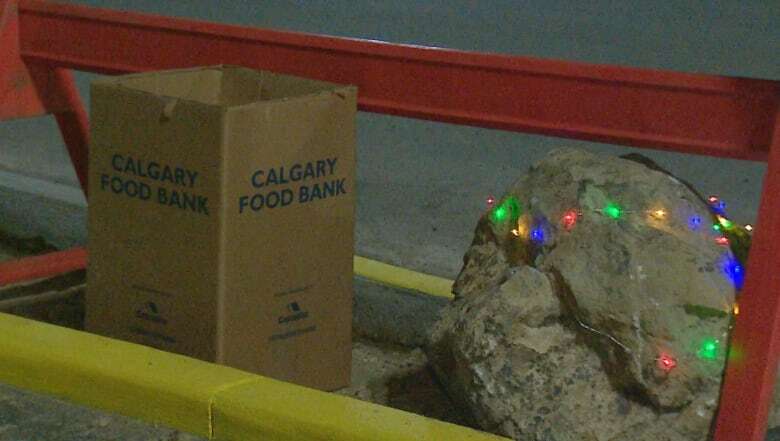 In a Facebook post Monday night, Jones said the Sage Hill Rock would be turned into a collection site for the Calgary Food Bank. Anyone coming by to take photos of the rock was urged to bring a donation for the food bank box. After this story was first published, an employee with the nearby bottle depot told the Sage Hill Facebook group the rock "might not be leaving," after all. "Since it's become so valued to the community, we're trying to negotiate having it moved to a different area of the parking lot, where it is safe from vehicles and doesn't have to resort to rage flipping them," she wrote. Jones was pleased by the development. "This is beautiful," he replied.